Yes sirree, it’s official: Sarah and I are creepy cat people. A few days ago we adopted a new kitten. 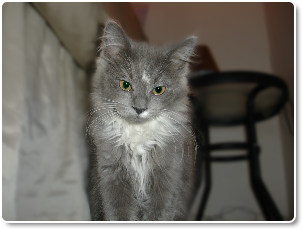 As you can see he is a grey long-hair with little white feet that are more like white streaks as he zooms from place to place. And because I am such a big nerd we named him Mac.